As covered in our last blog post, “Investment Hindsight Is 20/20, Part 1,” we provided evidence from a recent Dimensional Fund Advisors research paper, “The Mutual Fund Landscape,” demonstrating that you still shouldn’t rely on past performance as a predictor for future success. Today, we’re going to cover a few additional points that make this advice even more compelling: survivorship bias and expenses. Even as enterprising fund managers open new funds every year, they also close quite a few, often due to dismal performance. 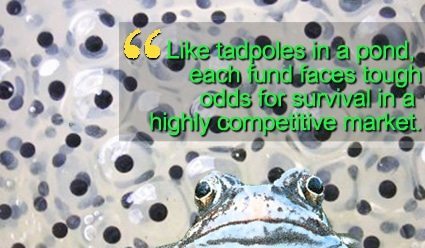 Like tadpoles in a pond, each fund faces tough odds for survival in a highly competitive market. For example, according to Dimensional’s report, there were 2,506 stock funds in 2003. Ten years later, by year-end 2012, only about half of those funds had survived. Of these, only 17 percent had outperformed their benchmark. That’s just over 200 “princes” out of the 2,500 funds born. The rest either became frogs or never made it at all. Fixed income funds fared similarly. Of 854 funds available in 2003, 57 percent survived to 2012, and only 15 percent of the survivors outperforming their benchmarks. Thus investors face an additional hurdle in picking winning stock and bond funds in the absence of a disciplined plan: finding the ones that not only survive, but that go on to thrive. Studies and marketing materials that report only the returns of the funds that remain might deliver misleading, overly optimistic results. In academic circles, this is referred to as “survivorship bias,” or a failure to factor in the poor returns of the funds that never made it. When considering past performance figures, it’s important to ensure the authors have accounted for this critical factor, otherwise you’re likely looking at numbers that are larger than life. Again, Dimensional turned to the evidence to make its point, assessing the net performance of high-cost versus low-cost funds (as measured by expense ratios). 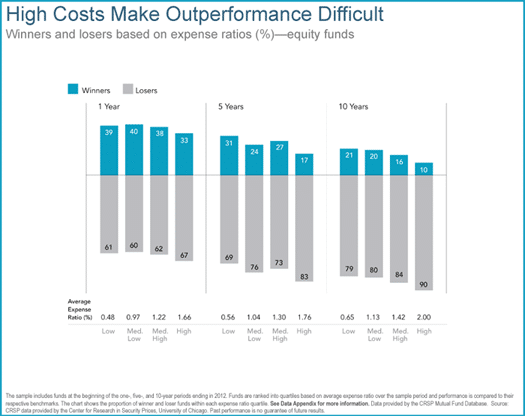 As depicted in Figure 1, especially over longer periods such as 10 years, the highest-cost funds both underperformed the most and outperformed the least, while the lowest-cost funds did exactly the reverse. (And that’s without even considering additional, less easily measured trading costs, such as brokerage fees, bid-ask spreads, and price impact.) Fixed income fund performance behaved similarly. Markets do a good job of pricing securities. Intense competition makes consistent outperformance difficult. Managers face cost barriers as they try to beat the market. Successful fund investing involves more than picking past winners. Consider a fund’s market philosophy, investment objectives, strategy, trading costs, and other factors. To this list (from Dimensional’s report), we would add: Find a SAGE advisor who understands these same tenets, incorporates fund families that likewise adhere to the science of investing and helps remind you why the evidence matters to your financial decision-making. Here’s a fun Brain Pickings animated short on the wonderful things that can happen when extroverts and introverts unite. From one of my faves, Susan Cain, author of “Quiet,” delightfully live-illustrated by Molly Crabapple. Enjoy!